Just in case anyone is unaware of the captive parrot licensing program run by the Forest department. All indigenous captive parrots in Belize require a permit. The permitting program will end January 1st 2015. The permits last from the day of issue until the death of the bird. From Jan 1st 2015, nobody will be able to apply for a new permit. Anyone found in possession of an indigenous parrot without a permit will have the bird seized and they will face prosecution. Ignorance of the law will in future cease to become a valid excuse. You can find details of the program at the link below, as well as download a permit application and the standards of minimum care that have to be met before the issuance of a permit. There is no fee for a licence to keep a parrot. Belize Bird Rescue are not in charge of the permitting process, nor did they instigate it, nor can they issue permits. Belize Bird Rescue personnel will advise on parrot care if requested and will also band your parrot when licensed to allow compliance. The Forestry department may ask Belize Bird Rescue personnel to advise if minimum standards of care are being met. Should your parrot be seized by the Forestry department, they may decide to transport the bird for care at Belize Bird Rescue, or they may decide to have the bird humanely destroyed. I would urge anyone who has an unlicensed parrot in their care, to apply for a permit immediately. 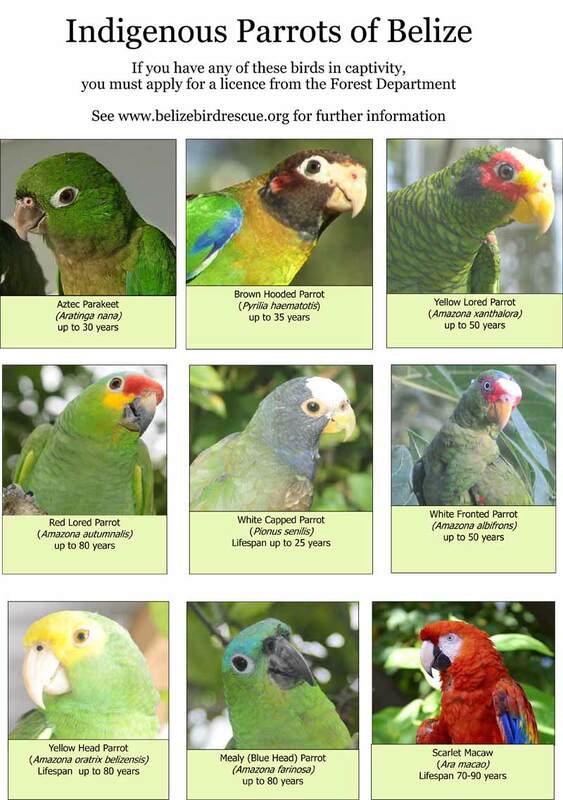 The Forestry department has a very long list of people keeping parrots and who is not licensed. There is not much time left if you want to have your bird remain as a pet. It is stressful for a parrot to be seized and transported. Who is in charge of the programme? Belize Forest Department Wildlife Programme administrates and governs the licensing programme. Belize Bird Rescue provides advice, and supplies the resources necessary to carry out the initiative. We have no legal authority within this Government of Belize programme. Why is this suddenly happening? The law has always stated that it is illegal to hunt, capture or keep a native parrot. This law is in place to safeguard the wild populations. Unrestricted hunting of wild parrots for the local pet trade is unsustainable and wild populations are now falling to dangerously low levels. One person from a household must be the applicant, and therefore the registered keeper of the bird. There can be only one application for a maximum of two birds per household. ptive Wildlife Permit application form, and submit it to the Belize Forest Department by fax, email, mail or in person. Can I license any bird? What are the licence conditions? My bird is not a parrot, do I still need a licence? If the bird was removed from the wild in Belize, it is an indigenous bird and is covered by the Wildlife Protection Act. You need to seek permission from the Forest Department to keep the bird. You should still use the same Captive Wildlife Permit application form, but you may be required to conform to different terms and conditions. If I apply, am I guaranteed to keep my parrot? If you conform to these conditions, then Forest Department are unlikely remove your bird. What happens if I do not conform to minimum standards? The Wildlife Programme Officers already have hundreds of inspections to carry out. Please be patient and they will come into your area in due course. Once you have submitted your application, you are advised to bring your conditions up to minimum standards as soon as possible: you are more likely to be granted a permit on first inspection if you conform. I was given permission to keep my bird in the past. Do I still need to apply? Yes. There have been very few official permits given. It is unlikely that the permit you have is still valid, and minimum standards have now been implemented so you will need to conform. Verbal permission is not an official permit under the new license conditions. You must apply for one of the new permits. When does the license period end? Forest Department has set a deadline for applications of December 31st 2014. There is a possibility that this may be extended, but this is not guaranteed and we would not advise that you wait to submit you application. All captive birds that have not had a permit application submitted for them will be confiscated. The owner may face charges or a fine. In exceptional circumstances owners may be granted extra time to apply, but we strongly recommend that you comply with regulations before December 31st. What happens when I get my licence? You will be issued with an official permit. Full permit conditions can be seen at the bottom of the page. You bird will be fitted with a permanent leg band. This does not hurt the bird at all. The band has a unique number which applies to that bird and corresponds to his official permit. The band cannot be removed for refitting as it will break. If you need to remove the band for medical reasons, you should visit a veterinarian or contact Forest Department immediately. It is valid for the lifetime of the bird, provided you maintain standards of care. If you move house, you must inform the Forest Department: the bird is registered to you at that address, you cannot transfer to another address or to another keeper without a reissue of the permit. What happens to my bird if it is confiscated? The bird will be taken to the Government sanctioned rehabilitation centre where it will undergo a long rehabilitation process to return it to the wild. Can I appeal if my bird is confiscated? I heard some people had their bird confiscated without warning. Why? My parrot is not listed on the indigenous parrot poster. What does that mean? I imported a bird and I have all of my paperwork. Do I still need this licence? No. But you should conform to minimum standards. Forest Department have jurisdiction over the standard of care of the bird. Following this licensing period, Belize Bird Rescue hope to begin a foster programme for birds that cannot be rehabilitated and require good homes. There is nothing official in place, and it may be considerable time before there is, but if you would like to register your interest in becoming a foster home, please email us. As an alternative, you may want to consider budgerigars (parakeets) as pets. They are better suited to living in cages, especially larger aviaries. They live well with multiple birds and are comfortable with less space, time or attention as a large parrot, particularly if there are several of them in one enclosure. They are being captive-bred in Belize and are available for sale. As of this moment they do not require a Forest Department permit, although you must conform to minimum standards of care. How do I encourage wild parrots into my garden/property? Planting appropriate food-sources and providing a safe and natural environment is by far the best way. See here for some ideas. Can I surrender my bird for rehabilitation? Posted : Marty Casado - Wed, Nov 26, 2014 6:49 AM. This article has been viewed 7737 times.